Halfway there! The first two games of this series have definitely been competitive, both ending with final scores of 2-1, in favor of the Astros. To hold what might be the best offense in baseball to two runs is nothing short of amazing. Masahiro Tanaka and Luis Severino acquitted themselves very well and, so far so good for Sevy regarding the potential injury he suffered. But not so fast. One game at a time. First, Aaron Judge. I can't find a word to describe his performance right now that doesn't sound like an understatement. He has been beyond painful to watch. However, I'd like to come to his defense. 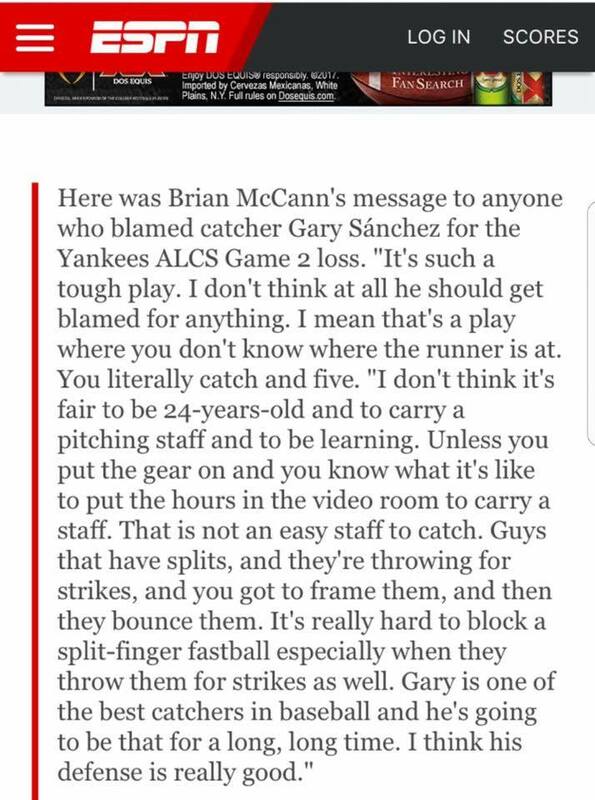 To the people who say he needs to learn how to hit good pitching, it wouldn't be good pitching if everyone could hit it. Good pitching stops good hitting. Also, to compare a rookie's postseason K's to those in the entire careers of Hall Of Famers (Joe DiMaggio and Yogi Berra) is absolutely ridiculous. They're Hall Of Famers!!! Finally, stop comparing the guy to Jose Altuve. Voting has already taken place for the AL MVP. Postseason numbers do not count. If they did, why would there be any need for the ALCS and World Series MVPs? Second (and this is the last one), Gary Sanchez. He caught a lot of grief after the end of Game 2. He admitted afterwards that he should have caught the ball. Good on him to man up like that. End of story, right? No, of course not, and do you know why? Because he's Gary Sanchez. People just love to dump on this guy. If he was anyone other than Sanchez, he would be excused. 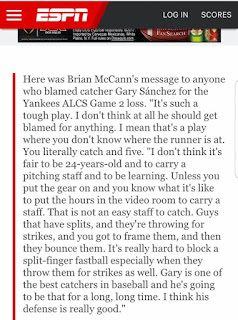 It's a shame that, once you acquire a bad reputation (as Sanchez did as a minor leaguer), any mistake at all is grounds for your critics to call for your head. Let's get on the board tonight. Go Yankees!